A VARIED SELECTION OF GENUINE FOSSILS FROM THE UK AND ALL ROUND THE WORLD. 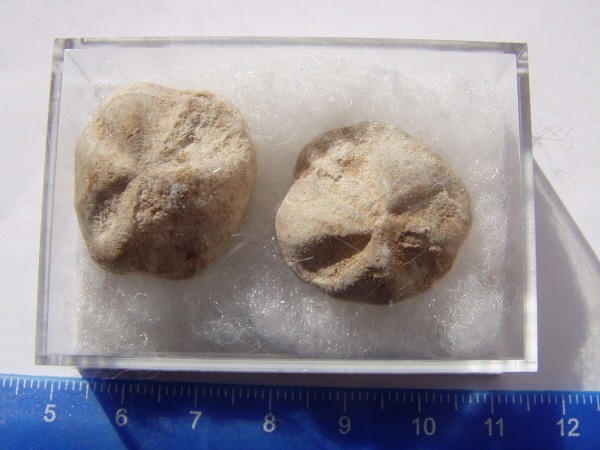 This is a truly beautiful set of 2 small Echinoids. They were living in the Cretaceous seas in what is now Morocco. Not often seen for sale - these Echinoids ( or Sea Urchins) show off their detailed spine lines and are superb little fossils. I only have a small supply of these so snap one up before they are all gone. You will receive 5 different bags - each containing from 1 up to 15 fossils. The set you will receive won't be the exact set pictured but will be very similar and some of the sets are better and with higher quality fossils than those pictured. The fossils are from the Devonian era - 417-354 Million years ago. while not the most obscure or rare of all fossils Moroccan fossils make a nicely affordable addition to any fossil collection. The Orthoceras was a marine squidlike creature with many inner chambers. It propelled itself through the seas over 400 million years ago in the Silurian age. This is a simple but unusual fossil. it is a fossilised rootlet from a tree. I can't tell you which tree as I don't know, but I am sure with a little research you could find out. This is a super and very large fossil Belemnite. 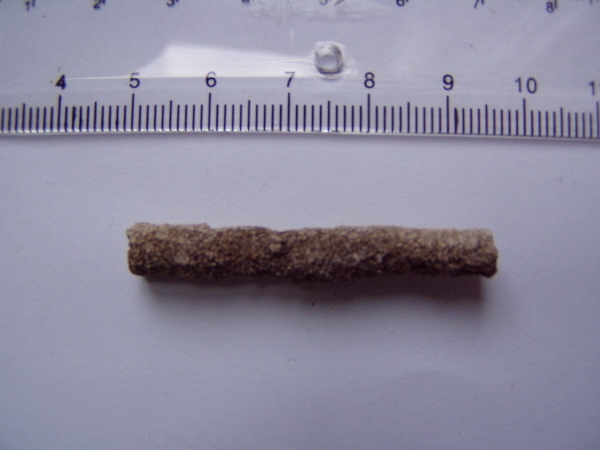 Belemnites aren't a rare or valuable fossil, but they are a very popular and well collected fossil for UK collectors. if a novice has collected a fossil from a beach or quarry, it will usually be either an Ammonite or a Belemnite. These I have to offer are far larger than the normal Belemnites you would collect. They were collected in the Midlands in England and date from. You won't receive this exact fossil pictured, but another VERY similar in size and appearance. I have a large box of these and they vary very little,other than very slight size differences. The Belemnite you will receive will measure at least 6cm long. These are large fat fossils and WELL worth what I am asking for them. Mosasaur - Early Crocodile Tooth - REDUCED! The Mosasaur was an early crocodile type marine reptile from the late Cretaceous. You will receive one of the pictured teeth. They all have lovely shiny enamel enamel with super colouration. A few of the teeth have slight damage, but this is common with these fragile teeth. The tooth will come in a padded gem jar and is a super little fossil. Gorgeous colouration in this fossilised wood. This super chunk of petrified wood is highly polished - which brings out the wide range of bright colours within the stone and also makes the original layered texture of the wood visible. Any of you who have been lucky enough to visit a petrified forest will know the appeal of petrified wood. Polished Moroccan Goniatite - NEW! This is a lovely fossil. The Goniatite is very similar to an Ammonite. It was an shelled aquatic creature and lived in the seas roughly 300 million years ago. The Goniatite is nicely polished and measures 5.5cm across. It would make a super gift for any fossil fan. Polished Moroccan Goniatite Plate - NEW! The Goniatite is beautifully polished and sits surrounded by a nicely prepared matrix. This is a very odd echinoid and while it's a truly fascinating fossil I really can't tell you a great deal about it. While most echinoids are easily described and are basically the same as modern sea urchins - this is more of an oddity and has a bizarre flattened shape which then has protruding fingers like a starfish...! It comes from Senegal in Africa and is approx 5 million years old. If you know more about it please let me know! EVIDENCE OF THE IMPACT THAT KILLED THE DINOSAURS!!! This is a very difficult item to categorise, but I have had to find a section. This is a boxed set containing 2 pieces of rock from the legendary KT Boundary. As anyone who knows their geology and palaentology will know, is the rock layer that is thought to mark the point at which the Dinosaurs were destroyed by a HUGE meteorite impact. 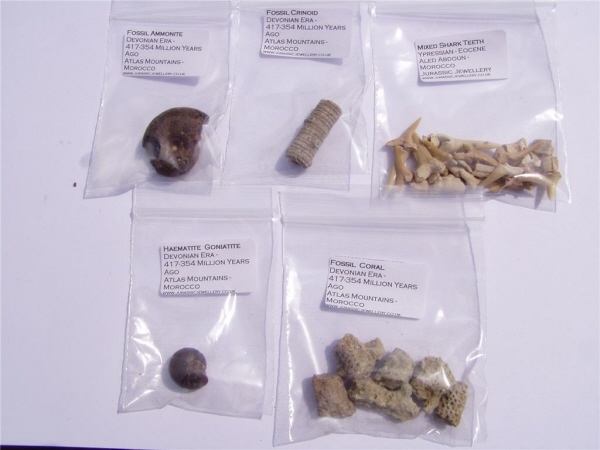 These samples come from the Upper Cretaceous Period of Trochu, Alberta - Canada.